Alive Inside from MVD Entertainment Group on Vimeo. Cedar Village, a Mason, Ohio, senior community. http://cedarvillage.org/join-us-for-alive-inside 7:30 p.m. Cedar Village 5467 Cedar Village Drive Mason, OH 45040 Directions are available by [clicking here]. Newnan Carnegie Library | 1:30 pm on April 27 | 1 LaGrange Street Newnan, GA 30263. First Baptist Church of Douglasville | 2:00 pm on April 30 | 5900 Prestley Mill Rd, Douglasville, GA 30135. Magnolia Performing Arts Theater | 7:00 pm on November 4 | students/faculty/staff 1:00 pm November 5. | 201 Community College Drive, Baton Rouge, LA. The Norwegian Short Film Festival is the oldest and most important short and documentary film festival in Norway. The festival takes place in Grimstad, a little seaside town in the south of Norway. Want to organize a private or semi-theatrical showing of Alive Inside in your area? Click below and fill out the form! For exclusive Alive Inside Foundation updates, news and discounts subscribe for our newsletter today! This stirring documentary follows numerous visionaries in healthcare including social worker Dan Cohen, founder of the nonprofit organization Music & Memory, as he fights against a broken healthcare system to demonstrate music’s ability to combat memory loss and restore a deep sense of self to those suffering from it. Rossato-Bennett visits family members who have witnessed the miraculous effects of personalized music on their loved ones, and offers illuminating interviews with experts including renowned neurologist and best-selling author Oliver Sacks (Musicophilia: Tales of Music and the Brain), healthcare visionaries Dr. Bill Thomas, Dr. Al Powers, Naomi Fiel, and musician Bobby McFerrin (“Don’t Worry, Be Happy”). Michael Rossato-Bennett is the Writer, Director and Producer of ALIVE INSIDE – winner of the 2014 Sundance Film Festival Audience Award for U.S. Documentary – and through film he strives to incite conversations that interrogate issues related to cultural consciousness. In addition to ALIVE INSIDE, his first feature length offering, Rossato-Bennett has several documentaries in various stages of development, through his production company, Projector Media. Each of those projects is inspired by Michael’s dedication to the collective well being of society and progressive human change towards the greater, if not greatest, good. Alexandra McDougald is the Distribution phase producer of ALIVE INSIDE. Prior to ALIVE INSIDE, Alex concentrated her efforts in publicity and distribution, serving as the lead on campaigns for Image Entertainment and Anchor Bay Entertainment, among others. Most recently, she managed U.S. distribution for Teza – the latest dramatic feature from celebrated Ethiopian filmmaker Haile Gerima – and led publicity for the home entertainment release of Spike Lee’s Red Hook Summer. ALIVE INSIDE is Shachar Langlev’s feature film debut as Director of Photography. Israeli-born and Brooklyn-based, he’s been gaining recognition in his field, garnering awards such as the Eastman Kodak Award for Excellence in Cinematography. Shachar works extensively with musicians in the hip-hop community and New York’s jazz scene and has shot music videos and live shows for MTV, VH1 and BET. He is currently in pre-production for his first narrative feature as well as for a documentary feature in collaboration with Elie Wiesel. An editor for twenty years, some of Manuel Tsingaris’ recent projects include: The Storm that Swept Mexico, a documentary that aired on PBS in 2011, telling the story of the 1910 Mexican revolution and A Dream In Doubt, which follows a Sikh man's journey to find peace and justice after his brother is killed shortly after 9/11. Manuel was also a contributing editor on the critically acclaimed mini documentary series, “Life 360” – a co-venture between ABC/Nightline and PBS. Barry Cole, Music Supervisor, started the Music Department for New York based film studio, The Shooting Gallery. Since that time, Cole has given music supervision to over 80 media projects. In 2013, he earned a Grammy nomination for producing the soundtrack album to the feature documentary Marley. As a Transmedia Producer for film and television, Cole employs new and emerging technologies to increase audience engagement and overall user experience. Dan Cogan is the Executive Director and Co-Founder of Impact Partners, a fund and advisory service for investors and philanthropists who seek to promote social change through film. Since its inception in 2007, Impact Partners has been involved in the financing of over 50 films, including: The Cove, which won the 2010 Academy Award for Best Documentary Feature; The Garden, which was nominated for an Academy Award for Documentary Feature in 2009; Hell and Back Again, which won the Documentary Grand Jury Prize and Cinematography Award at the 2011 Sundance Film Festival, and was nominated for an Academy Award for Documentary Feature in 2012; and How To Survive A Plague, which was nominated for an Academy Award for Documentary Feature in 2013. Cogan co-founded Gamechanger Films, which launched in September 2013. Gamechanger Films is the first for-profit film fund dedicated exclusively to financing narrative features directed by women. Founded by Chief Creative Officer Limore Shur, the brother of Alive Inside filmmaker Michael Rossato-Bennett, eyeball is a creative strategic design agency that shapes brands through powerful storytelling, stunning design, and insightful problem solving. By embracing client collaboration, its award-winning collective of thinkers, writers, artists and musicians efficiently translate brand ethos into engaging narratives and meaningful consumer dialogue, consistently generating quantifiable and powerful results. With twenty years of broadcast and ad agency experience, eyeball executes across a media spectrum that includes film, live action, design, animation, audio and experiential production. Regina K. Scully is an Academy Award-nominated executive producer, most recently for the 2013 powerful documentary called the Invisible War, a film about the epidemic rapes of women and men in the military. The Invisible War won the 2012 Sundance Audience Award. Scully also executive produced Miss Representation, a compelling documentary exposing the gender bias that still exists in our country based on the limited portrayals of women and young girls in our Media, Politics and Entertainment. Scully is also involved in the films, Fed Up, a compelling documentary that deals with the growing epidemic of obesity and diabetes in America; ALIVE INSIDE, a recent Audience Award winner at 2014 Sundance film festival; and Anita: Truth to Power, about the 20 year anniversary of the Anita Hill hearings. Scully is the Founder and CEO of Artemis Rising Foundation and is the Founding Sponsor of the Athena Film Festival in NYC. 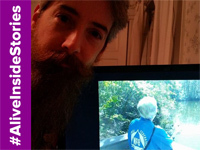 Mark Demolar is an editor and filmmaker, based in Brooklyn, New York. For the last five years, in addition to working in film, he has toured the country with his band Woodsman. A lover of art, he is known for his work in music video and video installation. ALIVE INSIDE marks Demolar’s first endeavor as a feature editor. His experience on this project sparked what is now a deep desire to discover new perspectives through the art of documentary narrative. Nan Li is a Beijing native, he studied Integrated Media Arts at Hunter College and is working with Michael Rossoto-Bennett on several other films. In addition to writing and recording, Shur has created an artist-development and production company. He also produces music for broadcast and computer animation. Shur is brother to Alive Inside filmmaker Michael-Rossato-Bennett. Geralyn Dreyfous has a wide, distinguished background in the arts and participates on numerous boards and initiatives. She is the founder of the Utah Film Center and co-founder of Impact Partners Film Fund with Dan Cogan. In 2013, Geralyn co-founded Gamechanger Films, a film fund dedicated to women directors. Her independent producing credits include the Academy Award winning Born Into Brothels; Emmy nominated The Day My God Died; Academy Award nominated The Square, Academy Award nominated The Invisible War and multiple film festival winners. Geralyn was honored with the IDA’s 2013 Amicus Award for her significant contribution to documentary filmmaking. Daniel E. Catullo III is an award-winning producer and director who has produced over 200 music videos and 150 live TV specials in his 20-year career. He has won or been nominated for more than 100 International Awards including Grammy, Telly, Emmy, Billboard Music, Juno and Golden Eagle Cine Awards. In addition to live TV, Catullo was an Executive Producer of the Oscar-nominated 2013 documentary The Square. The film, chronicling the uprising the toppled Mubarak regime in Egypt, went on to win numerous awards at film festivals from Sundance and Toronto to Dubai and Carmel. It also was awarded the 2013 IDA Award for Best Documentary Feature. He is Founder & CEO of The City Drive Entertainment Group the parent company of City Drive Films and DC3 Music Group and resides in Laguna Beach, CA with his wife Madelyn and his two children Isabella and Dylan. Dan Cohen is founder and executive director of Music & Memory, which promotes the use of digital music players with individualized playlists to improve the quality of life for elders, regardless of their cognitive or physical status. He received his MSW from Adelphi University. Dan has spent most of his career helping individuals and organizations better leverage technology. 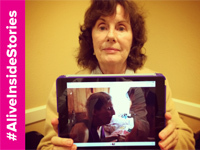 Music & Memory operates in thousands of long-term care homes across the U.S. and abroad. Stirring. A magical, non-medical story of healing. The Bottom Line - A gloriously inspirational film documenting music’s healing power in Alzheimer patients. An affecting look at a growing therapeutic cause. It's as transformative as the music itself. Moving and groundbreaking. The film far exceeded what I'd imagined. 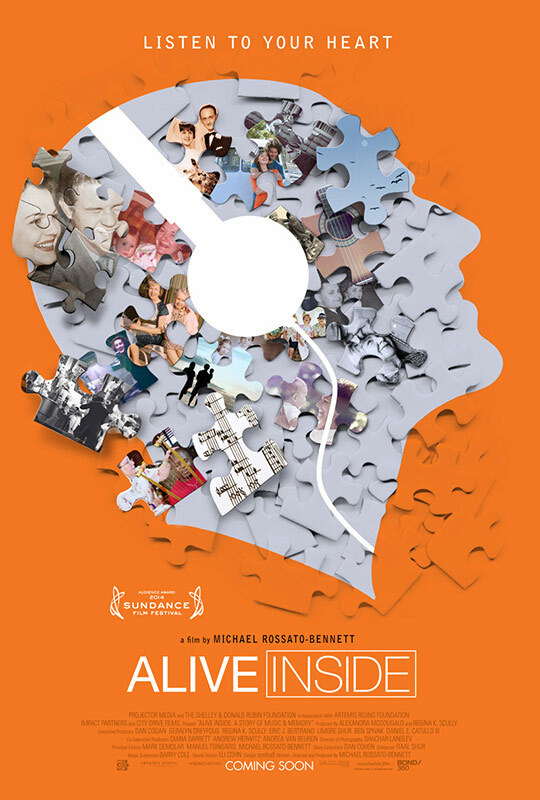 Alive Inside is a pitch-perfect documentary that brilliantly explores the transformational effects of music on elders with Alzheimer’s and dementia. Music has an unmatched power to bring back our pasts. Alive Inside' illustrates music's joyous power for dementia patients. 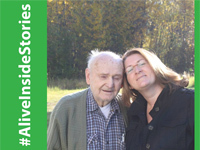 In a world drowning in bad news about dementia…'Alive Inside' is positively tonic. 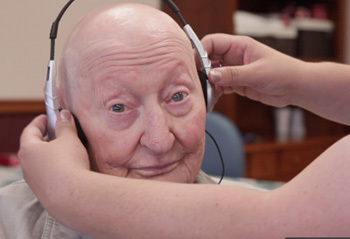 Rossato-Bennett hopes Alive Inside encourages more of the country's 16,000 nursing homes to embrace headphones and personalized music as an alternative to pharmaceutical treatments. Many of the subjects show deep emotional resonance to the music. Dan Cohen is the gifted and passionately committed man who transforms the lives of people with dementia and other severely debilitating diseases. In segment after segment, people with Alzheimer's and other conditions don the headphones, hear the music of their youths and light up. You’d have to have a heart of stone and bricks for ears not to be moved by the sight of Henry when the music hits him. Alive Inside packs as potent a simple emotional wallop as anything you’ll see – or hear – anywhere this year. One of the most important documentaries of the year. “An estimated 5.2 million Americans live with Alzheimer’s disease…” This number doesn’t even begin to include the many family members & friends affected by this disease. These are their stories, click on the photo to keep reading. This is our Thank You page! Without our funders and friends “Alive Inside” would never have been made! Together we won Sundance, Milan, Provincetown, Washington West, Berkshires, Sonoma and changed many lives and helped Music and Memory become a real force for change! Thanks for helping us win at SUNDANCE! Special thanks to the Alive Inside angels- our Executive Producers! We are also very grateful for the members of Impact Partners who gave us a loan to finish the film. And all these people who helped out in ways to numerous to count! Empathy, the sharing of the pain and the joy of another human being is the core power of Documentary Film-making. "Alive Inside" changed the world for many elders, but the film's questions still remain- How were so many of our elders forgotten? Can we reconnect them to life? To answer these questions, to teach the themes of the film and inspire action, we created The Alive Inside Foundation. To support this teaching we have created Educational Materials, "The Alive Inside APP," Mp3 All-in-One Headphones and Community outreach assets, all aimed at inspiring a generation of young people to explore empathy and elderhood through music. We bring this educational challenge to Schools, Universities, and places of worship. Be our partner. 100% of Donations go to teaching and implementing the themes of "Alive Inside!" This stirring documentary follows social worker Dan Cohen, founder of the nonprofit organization Music & Memory, as he fights against a broken healthcare system to demonstrate music’s ability to combat memory loss and restore a deep sense of self to those suffering from it. Rossato-Bennett visits family members who have witnessed the miraculous effects of personalized music on their loved ones, and offers illuminating interviews with experts including renowned neurologist and best-selling author Oliver Sacks (Musicophilia: Tales of Music and the Brain) and musician Bobby McFerrin (“Don’t Worry, Be Happy”). 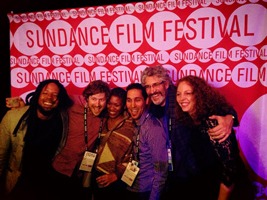 An uplifting cinematic exploration of music and the mind, ALIVE INSIDE’s inspirational and emotional story left audiences humming, clapping and cheering at the 2014 Sundance Film Festival, where it won the Audience Award. The Alive Inside Foundation, Inc. (EIN #47-3245766) is a non-profit organization exempt under section 501(c)(3) of the Internal Revenue code. 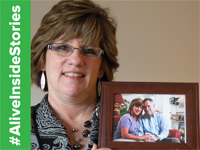 "My sister Delia was diagnosed seven years ago with early onset Alzheimer?s. When I saw the movie "Alive Inside." I was afraid to believe playing familiar songs could actually work, but, I downloaded two songs I knew she loved and walked into her hospital room. She was upset that day, gently I put on the headphones and turned on Diana Ross and the Supremes' "I Hear A Symphony." My sister sat up, started to sing along, even doing all the Supremes hand-motions! The nurses started peeking their heads into the room to see what was going on. When the song ended, Delia turned to Jeff, her husband, gave him a little shove on the arm, and told him what a funny guy he was. Truly, it was a miracle. For a moment, she was there with us. I had a glimpse of my sister back. Jeff had a moment of her knowing him, again and actually teasing him. It truly was a magical day in the midst of this long, hard journey. We want to give this to others. That?s a picture of my dad and I, a month after we moved him to California to be with us at the end of his Alzheimer?s, and it ended up being the last picture ever taken with him. He died a week later. Music was incredible. In the last years, he had it for 10 years and he was lucky enough to have one-on-one excellent care, and me, being an elder abuse lawyer helped, but you can?t stop the disease. The last year he was really out of it and music was so powerful for him. My sister can sing well and play, and she?d bring it in and we?d play ?Fiddler on the Roof? and Sinatra and the music of his youth and happy times with my mom and it moved him so much. It was the most animated he was; he?d hum with my wife, who sings opera, she has a good voice, and it was beautiful. Harold, Sandy?s dad. Well, he was pretty much like my father as well for about 35 years because I was not close with my dad and Sandy and I have been together all these years and his dad was such a huge part of our lives and I loved him, loved him, loved him! I was terribly sad, the Alzheimer?s was horrible but there were beautiful moment with it too and especially like when we moved him down here it was only 40 days before he died and I really had the opportunity to nurse him and mother him and baby him in ways that I never could have in other points of our lives. I felt like part of my purpose with him was to midwife him through his death and like?he wouldn?t know other people?s names, I would walk into the room he?d say, ?Hi Alice, how are you today?? He knew me. We just had an incredible connection all our lives but really those last 40 days, and 40 days is a very significant number, like in the Bible Moses goes off for 40 days, and Jesus?40 days is a really important kind of thing so for us it was very significant. He came, he was faltering, he had Alzheimer?s for 40 years, he was getting kicked out of his residential care where he was living, so we brought him, we put him into a 6 bed facility, very nice facility, and my husband and my son, they went to Boston to go look at colleges and Harold fell and he hit his head, so they called me up to go to the emergency room, so I went to the emergency room and I hung out with him through the night for like 6 hours, and all night long, I rubbed his chest, I held his had, I looked in his eyes and I said, ?You know what? You can go. You?re done. You?ve done a great job. Everyone is good? and I would name everybody, ?Your granddaughter is doing this, and you can go. It?s ok. You have permission.? And you know, within a week, he really started to falter and I told Sandy, ?You have to go over and release your dad.? So he did that too, and we put him. He came here, he wasn?t, like, dying. A couple of weeks into it, he went onto hospice, one day, the next day they said, ?He?s not in an active dying phase.? The next day he was dead. He died in our arms. He died within 12 hours to the day, 11 years, of his mother?s anniversary. It was all synchronized, it was something that was really making that happen. With the music, on his deathbed, this is an hour or two before he died, I?m laying in bed with him, I?m holding his hand, and we put on ?Fiddler on the Roof ? Sunrise, Sunset? and he?s trying to hum along, like he knew that. It was so beautiful. We held him and we released him. It was gorgeous. It was so incredibly beautiful. We just held him and when he was leaving we were just like, ?Go Harold, go, you go!? It was just incredible. The music was very important because that was a way to communicate with him. We?d turn on his favorite showtunes and stuff, or you?d sing a song like ?Take Me Out to the Ballgame? and all of a sudden he knew all the words and then the veil would come back down. I felt like my role in his last days was just, somehow or other, I was a conduit to him into another space that was peaceful and comfortable. She?s been blind since she was about 57, she has something that?s called Retinitus Pigmentosa and I have 5 sisters and a brother, we?re from Punxatawney, Pennsylvania though I?ve been in California since 1963. But, my mom is at home and we take turns taking care of my mother. I go back 2 or 3 times a year, and my sisters and I, we set up a joint account for her to help pay for her care, and she?s been at home. What happened is, because she?s blind, she loves CNN, MSNBC, Rachel Maddow, Chris Matthews, any progressive political whatever, my mother loves to listen to them and because she can?t hear well anymore, the TV would be turned up so loud that it would drive us all crazy so we went and got some wireless headphones and then she was sitting there with her wireless headphones one day and I had my iPod and so I thought, ?Well, we?ll connect them and see.? Unfortunately my nephew had programmed my iPod with 5 Kris Kristopherson albums. Now, I have nothing against him, I used to really like the old Kris, but my mother started listening to this, and she sat there for about an hour and a half. She thought it was the most wonderful thing in the world, and she learned how to turn the iPod and that?s very difficult when you?re blind and you can?t see anything. It?s hard for me, I don?t even know how to do it still. But my mother learned how to do it. So, my daughter and I were talking about what we could get my mother for Christmas that would really make a difference and of course, after watching the movie, I thought, ?Why didn?t I do this before?? I got her her own iPod and programmed it with the music she likes. My mother has very eclectic taste in music. My mother loves jazz, she loves blues, her brother, my uncle Jimmy, was a jazz trumpeter in New Orleans and Arkansas and all that. She likes Charlie Pride, she likes Merl Haggard, she likes The Sound of Music, Frank Sinatra, etc. So we?re going to get all of my mother?s music and put it on her iPod and get her some good headphones just for that and give it to her this Christmas. [My parents] were very poor. They raised 7 kids, she?s never complained. Even when she was going blind, you never heard my mother feel sorry for herself or anything like that. This is my grandmother. Her name is Maria Velasquez. She is everything to me. I never had a babysitter. She took care of me. I was her first grandchild. At the time when I was born, she was working in a nursing home and my parents said, ?Hey, would you rather watch your granddaughter every day?? and she?s been with me every day. She taught me to speak Spanish and makes really good food. She?s just an amazing person. I also got my sarcastic sense of humor from her as well. I think I?ve learned a lot from her. She?s a very strong woman, she raised 5 children, and raised me practically. I was actually born shortly after a long marriage that she had had and she was having a void in her life. When I was born, she suddenly had a new thing to focus her attention on. I was so close to her that at night I would cry and my parents would have to call her and have me talk to her and she would say, ?OK, stop crying, go to sleep,? and then eventually she moved in with us so I didn?t have to call her every night to calm me down but we?re very close. We?re like best friends. There?s a lot of songs that she would sing me to go to sleep and they?re in Spanish so we still sing them. She sings, ?Pio pio pio, dicen los pollitos,? she loves that one. There?s this other one where she says, ?dormite nenita/ que tengo que hacer/ lavar sus pa?ales/ sentarme a coser / y si no te dormis/ te come el coyote cabeza de ayote? and I would ask her, ?What is that?? and she would say ?A coyote with a pumpkin head is going to eat you if you don?t go to sleep? and I would say, ?well that?s not nice!? and she would say, ?well you should just go to sleep.? She?s a funny lady. My dad passed away this past September to Alzheimer's at the age of 79. I learned about this program prior to his passing and made it my goal to bring it to Springhill Senior Living Community . My dad lived here and I work here. Since his passing we have become Music & Memory certified. The program is named after my father, Dwayne D. Trautman Music and Memory Program. We have been sharing the film Alive Inside throughout the community. Really helps share the power behind music and how it can help people who suffer from cognitive impairment. Hymns and Christmas carols bring a light back into her eyes. Music was so important to my Mom on so many levels. It was how I helped her to remember her new address when she moved in with me. One of the fondest memories I have is when Mom's former recreational therapist Martha, came to visit her while she was on hospice. Martha brought along her guitar and played for my Mom and some of the other residents of the nursing home. Martha was sharing a story about the two Mary's who would patiently wait for their daughters to pick them up at the end of the day. They would end the day with sing along Sound of Music. Out of nowhere my Mom who had been pretty much out of it began to sing Edelweiss. Talk about the power of music! This is me with my grandma, Marcella. I love her dearly and was so inspired by Alive Inside. I love music and would love to see Grandma smile as she listened to some Lawrence Welk or polka music. Thank you for this opportunity to get music into more memory care facilities. My mom's dementia advanced greatly and quickly after two brain bleeds last year. Now she resides in a nursing home which has been a blessing for her and our family. We have found that she loves to hear music especially some of her favorites like Marc Antony and Bette Midler. A good Latin song with a fun beat makes her smile and she even sometimes tries to move and dance. I've been even blessed further being able to combine my clowning skills with music to share with other dementia patients at the facility. What little we can provide has been wonderful for many there and it would be amazing to learn and share this further. I am very close to my father. He is my papa-bear (Neil), he would put me on the top of his feet and dance with me when i was little and a song he liked came on the radio. He has Alzheimer's, Parkinson's and Dementia. When I go visit him with my daughters we usually have to wait around until he recognizes us or we just visit him until he gets tired. My Father and my youngest daughter have to same birthday...They are 64 years apart. I did buy him a pair of wireless mp3 player headphones w/ fm radio...when he listens to them he just lights up...I can see it in his eyes. Meet Orwyn, my Mother. She has had Alzheimer's for about 8 years and she is at the stage where her verbal communication is very low. When I am in her presence I sing, dance, walk, laugh, hug and hold her hands. I sing her favorite songs and my favorite songs. Some of her favorites are Brown girl in the ring, Amazing Grace, The Rose and Love lifts us up where we belong. After spending a little time together and if asked, who am I? She will say, "My Daughter?. My mom was found two years ago slumped over her computer, having had a very rare stroke. She now has short term memory loss. It's heartbreaking to watch her in her memory care facility. Although a gentle thoughtful man, Grandpa Ernie used to belt out the chorus of the Hymn with eyes his closed, his head shaking and clear voiced, resolved in what he believed, I can still hear his voice, hand curled at his side singing "Our God, He is Alive" Very missed by many grandchildren. Until today I had been reluctant to watch the film Alive Inside, but I am so glad I did. Dementia and Alzheimer?s disease are not new to me; my grandfather developed the early stages around the time I was born and my grandmother was diagnosed while I was a kid. The condition that was so foreign to my parents has been an almost constant circumstance in my life. Thankfully, this documentary reminded me of the extraordinary life that exists in nursing homes all over the world. One of the most incredible memories I have of my Mimi was from a visit with her a few Christmases ago; by chance, we began to sing Christmas carols to her and all of the sudden she opened up in a way that we hadn't seen for years. Even after she had stopped talking, she was able to sing along to each of the carols and hymns. She clapped, smiled and held our hands, showing us the beautiful life that had been hidden by disease. The music touched her in a way that words could not and it was like magic. I truly believe that every beautiful soul deserves this amazing opportunity and I am so inspired by the work of Music & Memory! My father is a jazz musician and my mom has always been around music. She is typically quiet and it can be hard to find the right words but music literally makes her come to life and laugh with joy. It is a great way for us to connect. Looking forward to seeing this movie! Mom has been in her own world with Alzheimer's for quite a while , mostly nonverbal a few words here and there, what a difference music has made to help us engage. I met Michael Rossato Bennett at a premiere showing of Alive Inside and he suggested getting a splitter so that we could use two headphones at the same time. What a great tip that I hope others will try! Mom and I regularly listen to her favorite music together and it is amazing the connection we now have through music. I hope we can spread this wonderful magic at Birchwood nursing home. Some days all I do is Snuggle up my Mommy, and that is enough no matter what mommy forgets or doesn't understand, I know she will always understand and feel Loved! Music is the way I communicate with my mom. If I'm not singing familiar songs to her, I use my smart phone with a blue tooth speaker to play music from her era, trying to find something that gets a response from her. We put the speaker in her wheelchair cupholder as we tour the halls of the nursing home where she lives. Often, we entertain fellow residents with our music while we gather in a small sitting room, passing the time together. 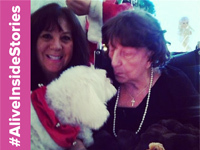 To learn more of our adventures together, go to www.caregiversunite.org. My mom loved music. She sang in the choir at church and loved the old hymns. During one visit to ER the month before she passed, my sister and I played "How Great Thou Art" on my iPad to help her stay calm. She looked me square in the eye and said "I love you." I hadn't heard her speak other than sounds or nonsensical words for months. That moment will stay with me forever. This is my granddad, Paul Wood. Although I am the in-law granddaughter he has always treated me like one of his own...from day one. Since his diagnosis in 2006 we have had to go through the painful decline over the years and it has not been easy seeing him disappear in front of our very eyes. He is now in the end stages of the disease. He is non-verbal now and needs assistance with every basic task. Once you discover your loved one has Alzheimer's disease it becomes very apparent to you the lack of knowledge, research and assistance out there to get families through this heartbreaking transition. I am so very grateful for the movie Alive Inside. It has opened a very small door for us to the man Granddad used to be. When I go to the house to see him I put on his favorite "Granddad" playlist and the music wakes him up! What was a blank stare before becomes a smile and tapping feet...what was a silent room becomes full of laughter and constant mumbling. They might not be full sentences or even words, but for just a moment in time he is there with us. Those few minutes mean the world to me. I love this man with my whole heart and I share the pain of all those who are posting their stories. Thank you for what you have done for us in making this movie and thank you for inspiring me to become active in the Music & Memory movement. My mom always has a smile! This is my dad of 88 years of age in what seems to be the final stages of this disease and on one of my visits with my grandson Brett I was determined to get some sort of response out of him. I asked him which daughter he liked better, me "Joan" or "Carolyn" his other daughter. I was surprised when he half opened his eyes and said " I love them both". I felt bad for playing such a trick but at the same time tears of joy that for a brief moment he remembered who we were. I miss you dad. 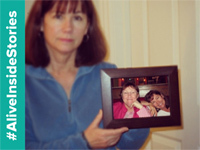 Several years ago my mother broke her leg and was diagnosed with Alzheimer?s at the same time. In the early stages of her recovery from surgery she was very despondent and confused. My brother and I worked with her for months to reconnect her to her life again. One day we brought a cd player to the rehab facility along with some of her favorite music. We put on her headphones and she closed her eyes. Within minutes she started to nod with recognition and tears began to stream down her cheeks. It was a sign of hope. When I was young I suffered from severe and crippling depression. My mother never gave up on me. She supported me through some very rough times and made sure that I got the help that I needed. Today my mother is in foreclosure and is facing the loss of her home of nearly 60 years. My brother and I are doing everything in our power to save her home because her mental stability depends upon it. I fight for her because without her unconditional love I probably wouldn?t be here to write this. I will never give up on my mom even if she forgets who I am. This is a picture of my mom and me taken about 7 years ago now. She's now 75. My mom taught me that everyone is born equal, to not be afraid to ask questions, that we are all the same underneath. My mom taught me to not be afraid of people in authority. It has helped me to challenge people when I think they are wrong or to question if I don't understand. To not feel intimidated. That it doesn't matter how important they think they are, you still have a voice, you are just as important. And you must always stand up for yourself. My mom had to stand up for me when I was little. She had to convince the doctors that the lump on my neck was not normal. 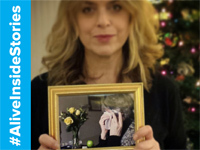 She never gave up challenging the doctors who said, what do you want me to do mother? Get a knife and chop it out? My mom never gave up. I am alive today because of her determination to be heard. I'm 46, I'm a two times cancer survivor, I have a phd, I am still challenging the medical profession 40 years later. And I still hear her voice in my head, everyday, to keep going, shoulders back, you're just as good as the next person. That's how she raised me. My mom is a great singer! Music is everything in our family. So Alive Inside really really resonated with me when I saw it in a little movie theatre in Wellington New Zealand this year. There are so many songs to include on the playlist of our lives! Matt Munro singing walk away, born free, for the good times, all three take us back to my dads passing. All three he would sing and we have recordings on tapes of him singing. So, we will build our playlists and we will continue making memories around music. And I really hope that these memories will be kept safe for when we really need them late on. I keep this picture in my office; my Dad died of melanoma that spread to his brain. I was a dancer in school so music was important and Dad and I shared a love of classical music. When I was in high school, he recruited a friend who had a great sound system to provide the music for a dance performance and took the day off work to be there. One Christmas Mom and Dad gave me a stereo and it came with a cassette tape that Dad had made by recording a classical music radio station. My Grandma Howard taught me unconditional love, acceptance, and commitment to family. I grew up in a situation where life was chaotic, and sometimes frightening, but grandma was calm security. Because of her I now work for the Long Term Care Ombudsman Program in Ventura County, California, advocating for vulnerable seniors. I will always love and honor you, Grandma! Jenzi shares the power of music with residents of her mom's nursing home: "Almost from when I started doing this, I noticed something truly remarkable: Residents who had appeared virtually unresponsive to anything or anyone, & who could not even remember where they were or recognize loved ones, would perk up on hearing a familiar song, becoming more alert & oriented. Often they would smile, tap toes or ?air conduct? ? & there were several who would sing right along, remembering the melody & virtually every lyric!" My name is Joe, I am 22 years old and live in Connecticut. Recently, my father has had the unfortunate experience of developing a fast paced form of frontal lobe dementia, he is only 63 years old He's holding a picture of us when I was inducted into the honors society at my university 6 months before he was transferred to a full time care facility for his disease. Not all the money in the world, or medication can cure the unfair disease that has not only affected my dad. It has stolen so many opportunities for me to create new memories with him. We used to turn on "James Taylor" Pandora station and hang out on the weekends, talking about school and work, while cooking amazing food with family and friends while sharing a drink or two. These memories will never be taken for me. They are irreplaceable. This picture of my grandparents at my wedding has been hanging in my office at work since 2005. My Granny suddenly and unexpectedly passed away about 10 months after that picture was taken. She was one of the sweetest, funniest, most beautiful people I have ever known. She loved to laugh and loved making others laugh. My favorite music related memory of her is from 1994 when John Michael Montgomery?s song, ?Be My Baby Tonight? came out. The pace of the song is really quick and she had trouble catching all the lyrics, so for about 6 months or so every time I would see her she would ask me, ?What are the words to that ?could ya, could ya? song again?? So I would sing them to her, ?Could ya, would ya, ain?t ya gonna, if I asked you, would ya wanna, be my baby tonight?. She would make me sing it over and over again at different speeds while she tried to sing along. Then, whenever she thought she had it, she would always say, ?now let?s sing it as fast as we can!? We would end up laughing so hard we would have tears streaming down our faces. While she never did end up getting the lyrics right, I sure loved to hear her try! One of the many things she taught me over the years was to never take life (or myself!) too seriously. I went to see Mom after 3 years of not visiting. She lives in Poland. I bought her a nice CD player and put on some of the CDs from her old collection. She was sitting in an armchair, after a long walk. Tired. Kind of lifeless. I put this track on, and? suddenly - it was as if a broken machine got fixed. She came to life. Her eyes opened wide and guided by my singing, she joined me throughout the piece, looking like she?s experiencing some great joy and pleasure. I had to return back to the UK. But I was already planning my next visit. I knew I have Jewish holidays of Sukkoth coming up in Oct, so I would have a bit of free time. I booked to go for 2 weeks in October. And all that time in between my 1st and 2nd visit was spent on networking, looking for a music therapist in Lodz, where she lives, and also buying her CDs with all operas I could think of, operas in which she participated when she worked at the Grand Opera House in Lodz. Gosh, I bought some 18 operas in sets of one more CD per opera. Then it took me ages to make copies of them all and have all titles printed. But I did manage. I was still finishing that undertaking at 4 am on the day of my flight - I slept 3 hours before it was time to get up and make my way to the airport. Anyway, I knew a musician friend here in London who currently studies music therapy. She put me in touch with a professor (PhD) of music therapy in Lublin, Poland, Dr Krzysztof Stachyra. It was he who told me about your film. When I saw the trailer - I was moved to tears. Cause I knew that I just experienced something so similar with my Mom just a week before I saw it. I thought that was a great co-incidence! I felt the magic vibes and thought I?m ?on a good wicked'. But to end this email on a nice note (pardon the pun) - my Mom has 2 hourly sessions of music therapy a week now. She is still getting used to it, I think. She doesn?t respond very well to the new ?assignments? by her lovely therapist Ms Joanna, but would rather play the same tune on the piano over and over again. But Joanna is not giving up. She?s determined to reach Mo in her strange world of confusion. Since I?ve known about your film - I?ve been letting people know about my story and the film, about the big discovery I?ve made. About the part of human brain, responsible for the music stimuli which doesn?t disintegrate during that horrible disease. It brings hope to people. I personally feel that the brain allows for all sorts of interactions with the outside world. We Jews believe that this is also where the part of human should resides, stretching further out of the body. (the point of connection is in the fontanelle, the place where a baby?s skull is softer). So I?m just kinda playing around with these ideas, thinking that perhaps music allows for a higher, more spiritual connection to take place. We learn from our sources that through music one achieves the highest connection possible with the Creator. So I think that the brain is the interface to allow this to happen and the way it seems to be done quite effectively is through the mystery of music.